Squire’s Garden Centre in Hersham celebrated the official launch of its newly extended and refurbished garden centre last Friday (March 17) – exactly 33 years to the day since it first opened in 1984. 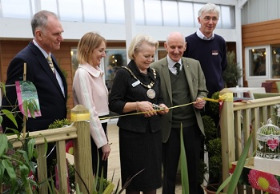 The Mayor of Elmbridge Councillor Tannia Shipley cut a ribbon with secateurs to officially open the new look garden centre. The shop and café bar are now 20% bigger, the plant area has a new layout with an extended glass canopy, the café bar has been completely refurbished with new furniture, and there is now a decked veranda area where customers can dine outside. There was a gardening theme throughout the day as customers took part in planting master-classes, followed by a 'Gardener’s Delight' champagne afternoon tea in the new café bar. Squire’s donated 10% of the ticket price to Greenfingers. Chairman Colin Squire commented: “Our Hersham garden centre opened 33 years ago on 17th March 1984, and it has been very exciting to see it develop and grow over the years.